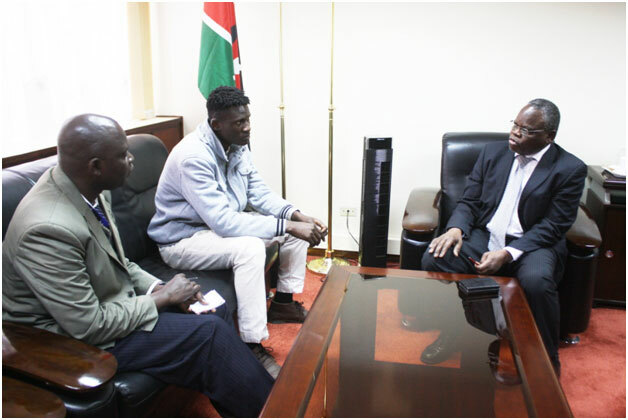 Michael Olunga (second left) poses with TUK Vice-Chancellor, Prof. F.W.O.Aduol (centre), Executive Officer in the Office of the Vice-Chancellor, Mr. C. J. O. Kanyadudi (right) and Assistant Director, Student Support Services - Sports and Co-Curricular, Mr. Maurice Ochieng (left) during a courtesy call on the Vice-Chancellor in his office. Many know him as a footballing genius, very few know that his genius goes beyond the football pitch. Meet 21 year old Gor Mahia sensational striker Michael Olunga Ogada who is also a second year geospatial engineering student at The Technical University of Kenya. Olunga was born in 1994 and raised in a humble household in Lakisama estate in Nairobi.He started his education at Babadogo Primary school where from as early as age 8 he would play football with his fellow pupils, he later joined Upper Hill secondary school where his football skills were noticed by the football coach who immediately recruited him into the school team. While at Upper Hill, his football prowess helped take the school to the national level where he was named most valuable player at Nairobi County as well as at national levels not only for his great sporting skills but also for scoring the highest number of goals at the tournament. Olunga’s star was on the rise. 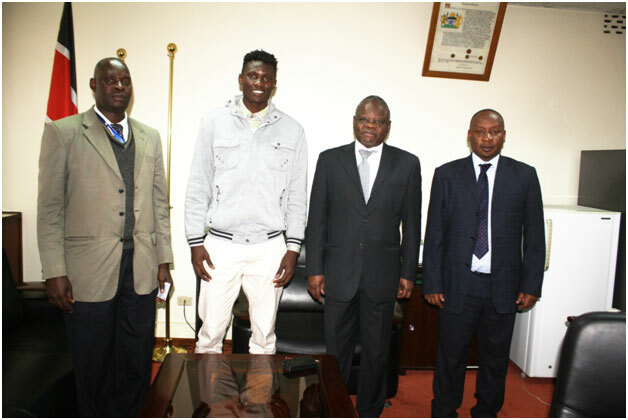 Upon sitting for his KCSE in which he scored an impressive A-, Olunga joined The Technical University of Kenya where he helped steer the university to the finals of the university and college’s league. The Gor Mahia striker has previously played for two other clubs in Kenya; Tusker F.C in (2013) and Thika United in (2014). The footballing talent was part of the squad that steered Gor Mahia to the finals of the just concluded CECAFA Kagame cup tournament and was named the top scorer at the tourney. Despite all these great successes, the soft spoken Olunga insists that his academics are still a priority to him. “My parents were against me playing football professionally because they wanted me to focus on my education, I opted to do both, they are now my biggest funs, and I therefore owe it to them to give my studies my level best” he says. On how he manages to juggle both passions so well, Olunga says that “it is challenging to combine both academics and football everything should be given its time, so I work hard and also pray a lot “. He trains in the morning and attends classes during the day. And when he has exams, Olunga insists that school always comes first. The footballing star is adamant that both football and engineering are in his future, “I would like to finish my engineering course and become an engineer by profession and at the same time play for the top leagues in the world like the English Premier League or La Liga in Spain”. Olunga is also very passionate about giving back to society and he would therefore like to set up a football academy for needy children to enable them achieve their dreams like he has. His passion for community service stems from his love for Nelson Mandela who he says is his greatest role model. In football Robin Van Persie is his role model being a left footed footballer just like him. Olunga exudes a lot of passion and drive for what he loves; the sky is the limit for this footballing engineer.